This is the ideal gift for a music conductor or indeed anyone who loves music or who has a Welsh connection. We also like to display such one of a kind items as this on our family Christmas tree each year, as well as looking absolutely amazing it pays homage to these beautiful decorative antiques from the past. This delightfully unique silver medal was given as a prize at the Grand Music Festival which was held in Rhyl, Wales, Great Britain on Thursday August 11th 1881. Rhyl is a seaside town on the North-East coast of Wales; in the town's heyday it was a popular Victorian holiday destination. Measuring: Diameter 1.5 inch (3.8 cm) by height 2.25 inch (5.8 cm). Weight 17 g.
The text on the medal reads ‘Grand Musical Festival. Rhyl. Aug. 11 1881. 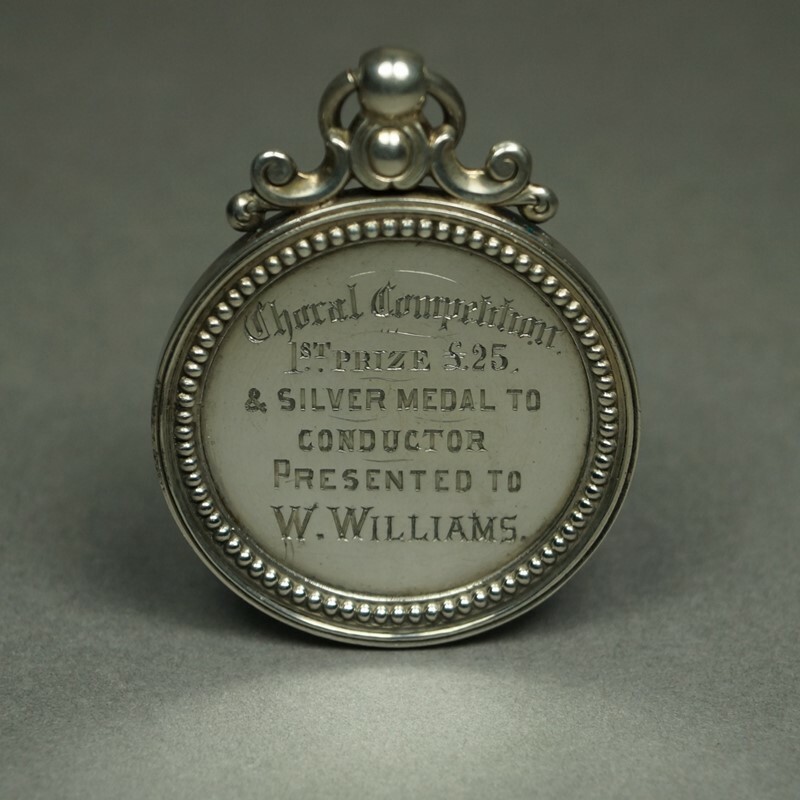 Choral Competition, 1st Prize £25 & Silver Medal To Conductor Presented To W. Williams.’ £25 was a large prize in 1881, equivalent to £2000 today!! William Williams (born in 1833) was married to Lucy Williams and lived in a grand Victorian villa called ‘Summerfield House’ on the Brighton Road, Rhyl. We have found the original ‘Rhyl Record and Advertiser’ July 6th 1901 newspaper article listing the auction date of his house and its possessions. Condition: Minor surface wear commensurate with age. Unmarked but tested as silver. This is a fascinating little item that will make the perfect curiosity piece. The medal will display excellently suspended on a ribbon of your choice, shown on our Christmas tree It would also look superb in a small period frame.